The Town of Normal continues to have an illegal public comment policy. Normal was forced to change the policy in 2017 when the Attorney General told them they can not have a policy that allows a citizen to only speak every 45 days. Instead of slapping the Town’s entire policy into oblivion, the AG only ruled on this one issue because people were denied the right to speak. Normal doesn’t want to hear from you – another reason Lorenz and McBride need to be defeated April 2nd. Chris Koos likes to pretend he is holding a “business meeting” instead of a meeting to conduct the “people’s business”. The Attorney General’s Public Access office could have saved themselves a lot of time by telling Normal what a public comment policy should say to comply with the law. Since they refused to do that in 2017, another complaint against the Town was recently filed. 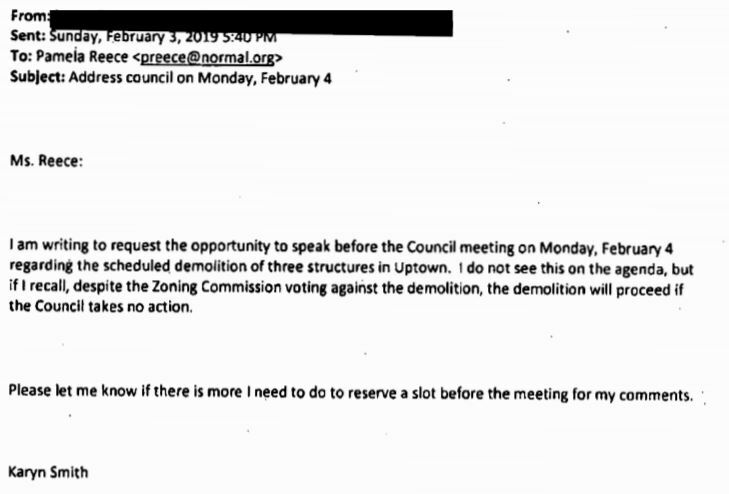 This time Council candidate Karyn Smith was denied her right to speak about the 3 historic buildings in Uptown on February 4th. Karyn filed a Request for Review and it has been accepted by Public Access. Side note: I FOIA’d the Town of Normal for correspondence with Public Access. This is an amazingly fast response from Public Access, hopefully the ruling will be fast too. I also received a ruling on a Request For Review originally filed in 2016, the AG’s office just got around to ruling on it. Normal lost that case too – it was for police documents. That was the WRONG answer Pam! The Attorney General will force them to change the policy as it apples to Karyn being denied, but they will likely not require Normal to allow comment by anyone who shows up until somebody is refused that right and files another complaint. Normal could prove they are government “For and By the People” but they won’t. Complaints need to be filed until Normal concedes defeat. That likely won’t happen until the Council is changed. Evidently the Town of Normal has not replied to the letter from the AG since I did not receive it. Posted in - - - Please Contribute - - -, BloNo, Constitution, elections, Koos, Local, Normal, Pamela Reece, Progressives.Tagged April 2nd election, Illinois Attorney General, Karyn Smith, Public Access, public comment policy, TOWN OF NORMAL. When I first encountered their public comment policy, I commented to Pam that it seemed more designed to Prevent input than facilitate it. It wasn’t ’til much later that I learned from somebody in the know that my ‘seemed’ was inaccurate and unnecessarily nice, as that was indeed the intent. 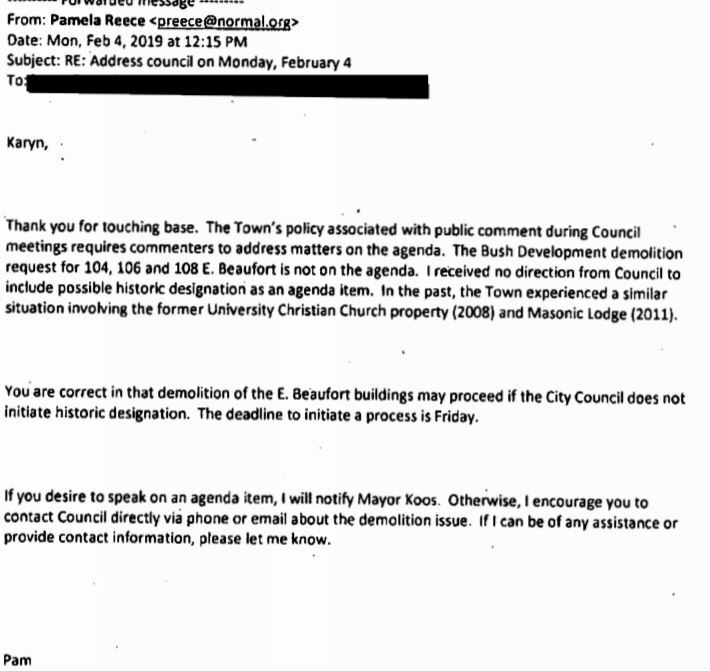 It should be noted, Karyn wanted to speak on behalf of thousands of Normal’s citizens, and Normal’s own historic commission, who all wanted to save the historic buildings from being demolished. She was explicitly denied the ability to represent them. The Council has shown that even their own commissions are meaningless when it comes to Uptown. All good points Stan. This is also a guy Normal citizens need on the Council. And you know who lives in one of those government subsidized luxury apartments, Stan? Sonja Reece, mother-in-law to Pam, our city manager. Let that sink in for a moment. Sonja who pushed the whole uptown project when she was on the Council now rents, not owns a government subsidized luxury apartment in uptown. Her rent payment is paid to an out of town developer who gets a property tax break that the rest of the homeowners in Normal don’t get. IN the meantime, Sonja’s not paying the property taxes she imposed on Normal residents because she’s renting. Unless you count her exorbitant rent payment as the equivalent to paying taxes, but her rent is going to Tartan in Chicago, not Normal. So much for local development benefiting our local economy. By the way, Pastelle Magazine did a feature story on Sonja and her uptown living some time ago. Made me want to vomit. It isn’t on line anymore, if it ever was. Just another example that the city of Normal does NOT want to hear you they just want you as a citizen to keep your mouth shut and pay your taxes when they tell you to.